"Ticket to Ride" is a railway-themed board game designed by Alan R. Moon and published for the tabletop in 2004 by Days of Wonder. It was developed for iOS, and was among the first of the Eurogame translations to hit the Apple ecosystem when it was released in 2011 for the iPad. The game has a relatively simple non-collectible resource deck mechanism, with players attempting to complete railways connecting one city to the next, also selected randomly from a separate deck. "Ticket to Ride" retails for $7 on the iOS app store and is complete in its own right. It has seven in-app purchases as expansions: USA 1910, Europe 1912, Switzerland, Asia, India, Nordic Countries, Pennsylvania, and Germany. All told (when not on sale) the entire Ticket to Ride package for iPad sells for $37. Once upon a time, the "Ticket to Ride" for iPhone and iPad were not universal, so if you've got an older installation, be sure to update your app to get all the benefits of the new one. Some of the maps have recently been re-released bringing down the price differential some, but the total for the Amazon physical copies are still priced at $104 —an $87 difference compared to the complete iOS version. 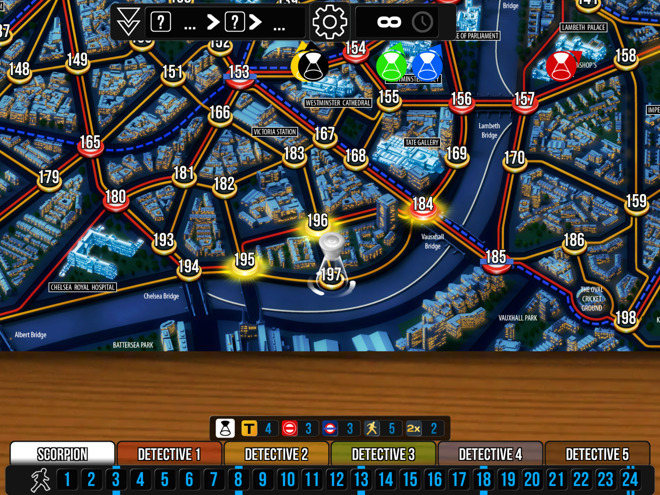 "Scotland Yard" is a board game in which a team of players, as police, cooperate to track down a player controlling a criminal around a board representing the streets of London. It is eponymously named after Scotland Yard, the headquarters of London's Metropolitan Police Service. "Scotland Yard" is an asymmetric board game, and unusual in that the detective players work cooperatively rather than competitively, solving a variant of the classic pursuit-evasion logical and logistical problem under a time constraint. The game costs just $4 on the App Store, and there are no in-app purchases or expansions for it. The physical copy of the game is $60, a $55 dollar difference. "Neuroshima Hex" by Polish publisher Wydawnictwo Portal is played on a hexagonal board. Each player periodically draws from a deck of hexagonal tiles, symbolizing different types of military units. Annotations on the tiles denote the combat strength of each unit. Each player has one special headquarters tile, with players take turns placing their generally immobile tiles on the board with the goal of destroying the opposition's HQ tile. At first glance, the strategy seems simple, but different units have different special abilities, like a net to disable a nearby unit, or fast speed, to act before another unit. Other units have no inherent offensive potential, but give boosts to units around them. Combat is turn-based, with the army herd being thinned as the game wears on. The victor is the player who scores more points of damage on the enemy's headquarters. 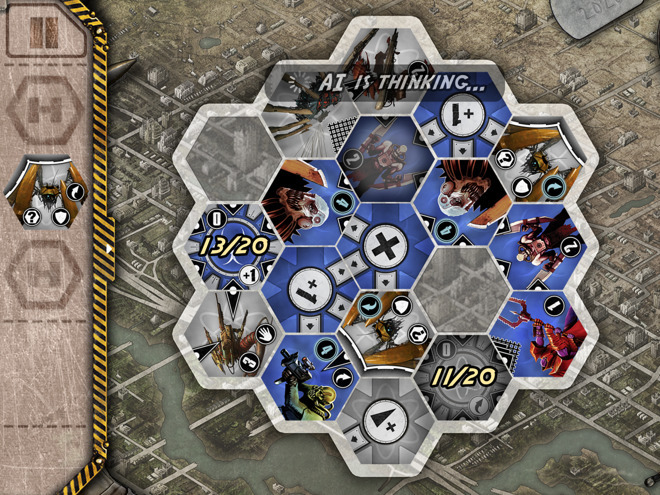 The iOS version of "Neuroshima Hex" is by Big Daddy Creations, and sells for $5 when not on sale. In-app purchases for nine different factions retail for $2 each, bringing the total possible cost of the game to $23. With the physical version, the 3.0 version of the game retails for $37. With all the factions purchased for the physical game, the complete set comes to around $120 —a $103 difference over the iOS version. "Space Hulk" is set in the "Warhammer 40,000" universe, and draws a certain degree of inspiration from the Alien movies. A "Space Hulk" is a mass of ancient, derelict starships, asteroids, and other assorted space debris, which a group of Space Marine Terminators is sent to investigate. One player takes the role of these Terminators, while the other player or the iPad controls the Genestealers, an aggressive alien species who have made their home aboard the Hulk. This was a tough one to include. The original game developer, Games Workshop, has a checkered past with its fans over the better part of the last three decades; the iOS and PC versions of the game shipped with some enormously show-stopping bugs. 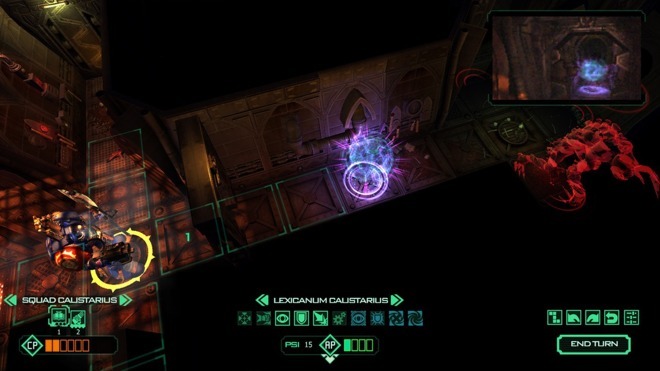 Recent patches on both mobile and computer have cleaned up most of the major issues (but none have brought 64-bit code to the title), with the exception of the massive 4-gigabyte footprint the game occupies on the device after download. The game on iOS retails for $10. In-app purchases for more campaigns and unit skins are available for an additional $17, bringing the total package up to $31. The limited re-release of the physical board game in 2014 is currently available on Amazon for $142, with an original retail price of $200. The second edition of the board game from the '80s is available on eBay, routinely selling for $50 and up. Even assuming the lowest retail for the second edition ruleset from 20 years ago, this is still a $19 dollar difference between the digital and physical versions, and possibly much, much more depending on version. For the sake of argument, we'll use the normal $142 price for the more complete 2014 re-release, and call it $111 differential between the board game and the iOS release. A note of warning about "Space Hulk" for the iPad: We really don't recommend playing it on older hardware. It really demands a beefier processor for adequate play. The iPad Air 2, the new iPad, and any iPad Pro make this game sing. Known simply as "Catan" on the App Store, "The Settlers of Catan" is a multiplayer board game designed by Klaus Teuber and first published in 1995 in Germany by Franckh-Kosmos Verlag as "Die Siedler von Catan." 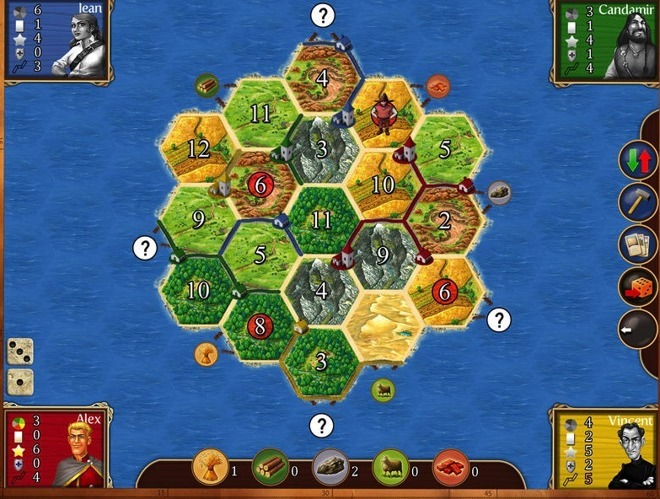 Players assume the roles of settlers, each attempting to build and develop holdings while trading and acquiring resources. Players are rewarded points as their settlements grow and their reach expands; the first to reach a set number of points is the winner. "The Settlers of Catan" was one of the first German-style board games to achieve popularity outside of Europe. When not on sale, "Catan" sells for $5. While the physical version benefits from many more possible expansions to buy, the ones available have a combined retail price on Amazon $129, a difference of $114 between physical and iOS versions. There are both iPhone and iPad versions of "Catan," which is unfortunate. Try as we might, we couldn't get our in-app purchases to propagate across versions, so pick the version you want carefully! There are literally dozens of board game implementations for iOS available. We spoke earlier of "Monopoly" and "Scrabble," which are oldies, but goodies. Some of the rest of our favorites are "Carcassonne," "Blood Bowl," "Agricola," "Castles of Mad King Ludwig," "Le Havre," and "Splendor." As a bonus, many of these titles have versions for older operating systems, so even your original iPad you've got stashed somewhere might be able to get in on the action. If you prefer the physical versions of games, there are many play-aids for games available —"Catan" has an official one, '80s robot-stomping game "Battletech" have a few which are difficult to suss out sometimes, and the board game implementation of "XCOM" requires an iPad to play! "Dungeons and Dragons" has about a thousand different play-aids. For the more generic needs, there are hex-map apps, and dozens of dice rollers. Fantasy Flight games has taken a slightly different tack to apps for some of its boardgames. It has built an artificial intelligence to play its dungeon crawler Descent, and an artificial intelligence for Star Wars board game "Imperial Assault" is now available too. If you've got a favorite, leave us a comment and tell us about it! There are benefits and disadvantages to both iOS and physical versions of games. It's hard to cluster four players around a single iPad to play a game, but cleanup and setup is way, way faster with the iOS versions. Some titles can be sent to an Apple TV with AirPlay or Apple's Lightning to HDMI adapter, making the small screen less of an issue. "House rules" are nearly impossible on iOS games, unless already selectable in a preference somewhere in the game —for instance, some of the more popular Monopoly rules, like money on the "Free Parking" space are generally toggle-able. One might think that the barrier to entry on the iOS is the cost of the iPad, but if you add up all the savings for all five titles here, you're looking at about $500, far more than the retail of a new iPad. 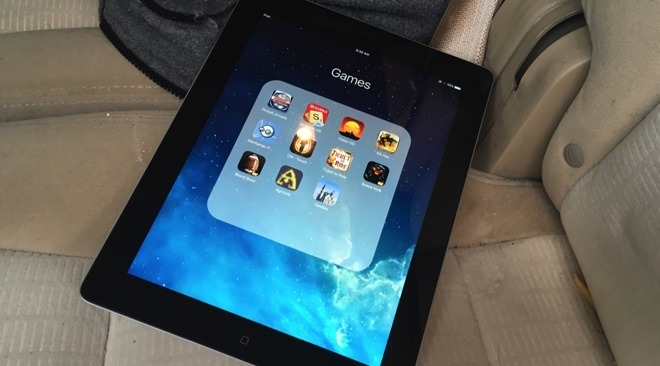 Regardless of the list of pros and cons, iPad gaming goes far beyond simple school-house favorites, with something for everybody.